The history of the Iranian revolution is interwoven with the history of cinema: In 1978, on the verge of the revolution, more than 130 cinemas burned down across Iran, 28 of these in Tehran. Who was responsible? Cinema became a major matter of contention on the cultural battleground as the revou The public was outraged and demanded answers: Which films should be shown, which not? Which films will be made, which not? Which movie theater will be kept, which abandoned? And of course: How much will a ticket cost? Composed entirely of archive material and equipped with a groovy jazz score, BLAMES & FLAMES is a brilliant essay film, and a meditation on the role of cinema, television and film in any society. In the early hours of Friday, September 20, 1979, a curfew was announced in Tehran and several other cities in Iran. That same morning, soldiers positioned in zhaleh Square, in the heart of Iran’s capital, opened fire on the people uninformed of the curfew. The exact number of the killed and the missing, most of whom were everyday people, has never been known. Not only the eyes of the cameras missed this slaughter of innocent people but it faced also the state-run media censorship. 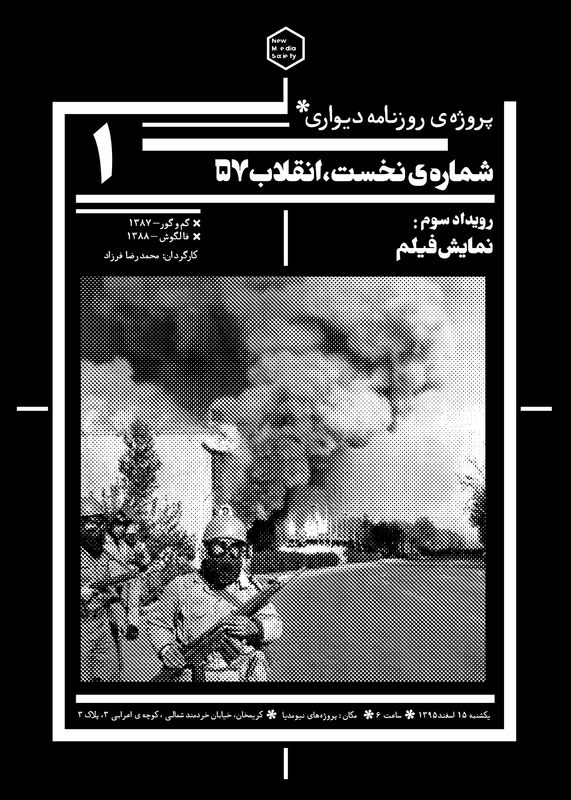 Before this film, the only cinematic evidence of this incident was a less-than-a-minute footage from an unidentified person’s camera; an evidence which was published as a document after the fall of the governing regime and turned into one of the most horrendous reminiscences of the 1987 revolution. “Into Thin Air” is the picture-reading of a documented reminiscence and a narrative of the “victim” on the fringe of all political massacres. This might be the story of all yesterday and today’s victims of political massacres in my home and that of yours. Born September 1978, Graduated MA in theater study from Tehran university of fine Arts. He started his art career as poet and translator published half dozens of books. As documentary filmmaker he has made some films Awarded and screened in national and international film Festivals. His first and second films “Into Thin Air” and “Blames and Flames” premiered at Berlinale 2011, 2012, shown in almost 30 film festivals till now. His third titled “Forget-Me-Not Egg” premiered at Thessaloniki film festival (2013) screened in dozens of International film events. His latest debut feature documentary “Wedding: A Film” (2015) Premiered in “Next Masters” competition of Leipzig documentary film festival, now going into film events across the world. Farzad has been a PHD student in Film Factory headed by legendary Hungarian auteur Bela Tarr. He also acted as jury member in some International film festivals.